Hilda Anna's is a quaint stone cottage, built in the early 1900's, with high ceilings, charming fireplaces and filled with old world appeal. It is clean and roomy with all linen, towels and basic living essentials provided to ensure you have a relaxing break. Being centrally located, Hilda Anna's is only a 5 minute walk from cafe's, restaurants and shops. In addition, it is an easy 15 minute walk to the river or 5 minute drive. The local golf course or race course is also within easy access, (approx 5 mins drive or within walking distance). It has secured under cover parking room for one vehicle. However there is space for another vehicle in the driveway. Hilda Anna's is a pet friendly residence, upon prior arrangement. There is a large, fully fenced, courtyard at the back with a second enclosure to the side. The front of the house faces a small lawned area with a rose garden and again, securely fenced. A dog park is located just a few blocks away. A simple self serve/cook breakfast is provided of cereal, bacon, eggs etc. The bathroom contains a large, deep tub, perfect for a long hot soak. There is also a large shower and separate vanity. 6 towels are provided and there is a small hairdryer. Soaps, shampoo & conditioner, bath salts, bubble bath, body lotion, body wash and hand wash are all provided. Plenty of storage space for personal items. Reverse cycle air conditioning is available plus there are ceiling fans in all 3 bedrooms as well as the lounge and dining rooms. Reverse cycle air conditioning unit provides heating as well and there is a slow combustion wood fire which is only available during the winter months. All bedding including pillows and extra blankets are provided. The only working fireplace is a slow combustion wood fire which is located in the lounge room and is only available during the winter months. Free off the street parking for 2 vehicles. 1 lockable Carport/Garage which has room for 1 vehicle. Towels, bathmat and soap are provided. Large living room with TV and DVD player. Seating enough for 6-7 people. Medium sized refrigerator with small freezer. Espresso maker is provided as well as a plunger coffee maker - coffee for both is included. 4 slice toaster is provided. Jam, Vegemite, olive oil, salt, pepper and spices are provided. Instant coffee, tea bags and sugar are also provided. Also milk, cereal, bacon, eggs, bread and orange juice for breakfast. A full set of dinner ware is provided as well as mugs, serving plates, salad/chip/nut bowls, glasses, including wine glasses and other items such as ice buckets, serving utensils, and pots and pans. Large kitchen with full cooking facilities and walk in pantry. A separate dining room is provided seating 6. Hilda Anna's is very centrally located and is pet friendly upon prior arrangement. It's easy to walk or ride your bike to shops and restaurants. The supermarket is literally just around the corner. Other local attractions within the town, such as the river, the cinema, museums and art gallery can all be accessed either by car or foot (or bike). However, we're very close to other South Australian attractions if you'd like to have a day out. Adelaide is only 45 minutes by the freeway. Or if you're after a wine tasting or two, the Barossa is only 45 - 60 minutes away or Langhorne Creek area is a mere 15 minutes drive. The Monarto Zoo is a short drive and cute country towns likeTailem Bend are close by, 20 minutes drive or so, or visit beautiful Strathalbyn which is just a little further away. Alternatively, take a scenic drive to coastal towns like Victor Harbour which is approximately 1 hour away. Perfect. Personal touches. Fresh Fowers. Spacious and homely. Definitely recommend. We had a great stay in Murray Bridge for the vintage rally. The accommodation was great. The host was very accommodating of our needs with good communication and we found the place without problems. Great location easy walking to shops. Would recommend this as a place to stay. Janet is a fantastic host, early check in was not an issue,communication was excellent,the premises was very clean and comfortable. The family had a great time. Will definitely use Hilda Anna's again when staying in Murray Bridge. Clean, well equipped and located. Friendly and helpful host. 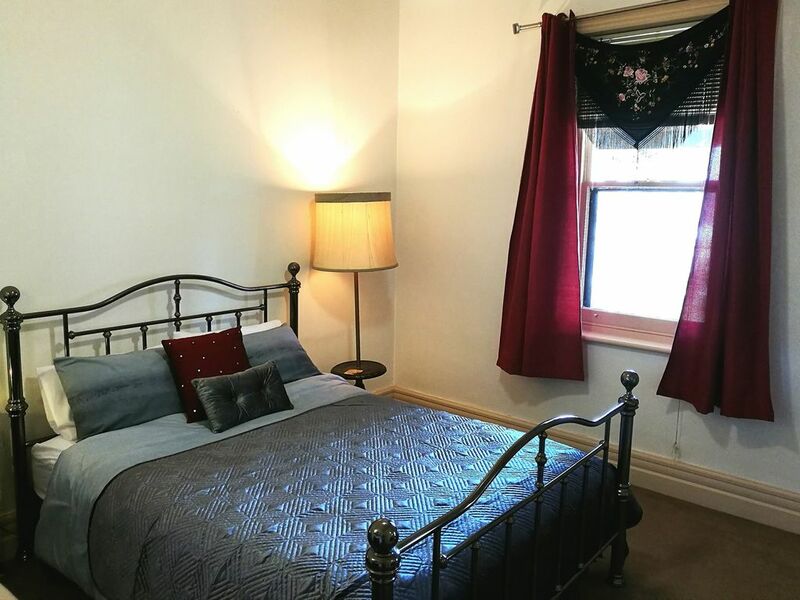 Very clean, well equipped like home and close to Murray Bridge shops and facilities. Friendly, communicative and helpful host. Quaint cottage with gorgeous little touches. Fresh flowers, coffee pods and fresh breakfast. The front bedrooms bed was very comfy didn't use the third room. Sheets and coverings very soft to sleep in. Bathroom was clean and up to date. Pity we had rush off in the morn and not enjoy it more.